Edward Koren's two worlds — Vermont and New York City — are alternating settings for a dozen of the drawings included in a sampling of his work currently on display at a Manhattan gallery. 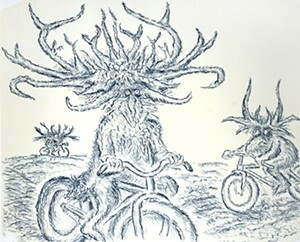 The rest of the 25 pieces in "Wet Ink" and "Bikes and Beasts" are situated in an imagined realm where hairy creatures, mostly sporting intricate antlers, pedal bicycles across barren landscapes. Koren, who's edging toward 80, is Vermont's cartoonist laureate. He draws in a scribbly style readily recognizable to any regular reader of the New Yorker. He began selling cartoons to the magazine in 1962 when he himself was a New Yorker, and continues that association from the home in Brookfield, where he has lived full time for many years. Koren's work also appears on many a poster or T-shirt he created pro bono for nonprofits in his adopted state. One of Koren's it's-got-to-be-Vermont drawings in the New York exhibit depicts a rural bar with "lite" beer on tap, a TV set in a corner and pool players in the background. In the image, which ran in the New Yorker, a guy wearing a hunter's cap holds up a glass of wine and asks the bemused, tattooed bartender, "Hey, Jimmy — am I nuts or does this have a hint of oak?" In another drawing, a similarly gentle putdown of gourmet pretensions takes place in a fancy restaurant that is surely in Manhattan. A formally dressed mom and dad look up from their menus as their pigtailed daughter asks the waitress, "And exactly how is the peanut butter and jelly prepared?" Koren's New Yorker cartoons usually take "quotidian themes" as their subject, observes Luise Ross, owner of the gallery in the Chelsea art district that bears her name. "That's his gift — to make the ordinary funny." 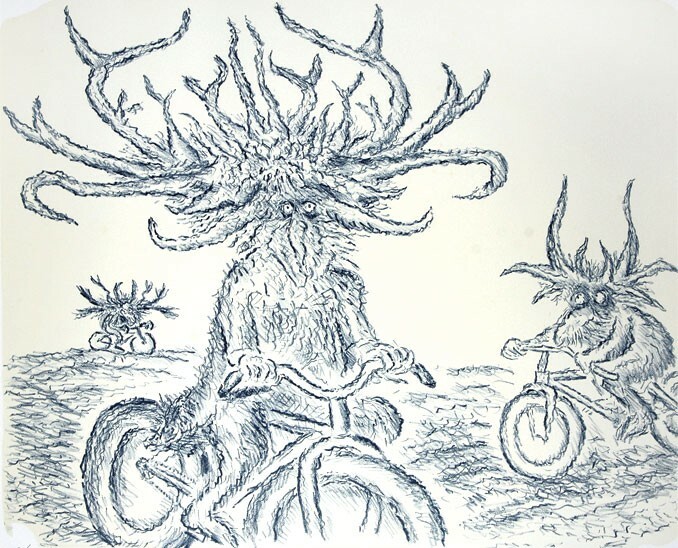 But the other drawings in the show, as well as a set of five lithographs that feature scraggly-nosed, beady-eyed beasts on bikes, clearly were not inspired by daily life. So where did they come from? They're representations of "how I feel sometimes, particularly in hostile traffic," explains Koren, who's been riding bikes, mostly joyously, for seven decades. The shaggy cyclists are also suggestive of "a state of nature, which is what a bike takes you back to," he says. He sees, hears and smells plenty of nature while riding his mountain bike along dirt roads near his rural home. Koren's beasts all wear blank or grimly determined expressions as they pedal singly or in groups. His invariably long-nosed men and women, however, almost always smile wryly or bashfully, whether in a Vermont farmyard or with the Brooklyn Bridge as a backdrop. It's a look he gives even to the three sets of songbirds perched on tiered telephone wires and labeled "Basses, Tenors, Sopranos." Human or avian, Koren's figures aptly convey the artist's own droll yet warm-hearted sensibility. "Wet Ink" affords visitors the opportunity to encounter Koren as an artist, not just as a jokester. The show's selection of original drawings made for the New Yorker are roughly four times the size of the reproductions that ran in the magazine. They enable viewers to appreciate the quality of his line and the clarity of his compositions. "Wet Ink" and "Bikes and Beasts," on view through April 11 at the Luise Ross Gallery in New York City. The original print version of this article was headlined "Vermont's Cartoonist Laureate Ed Koren Has a Suitably 'New Yorker' Exhibit"